Race Report By Gary Tuttle. 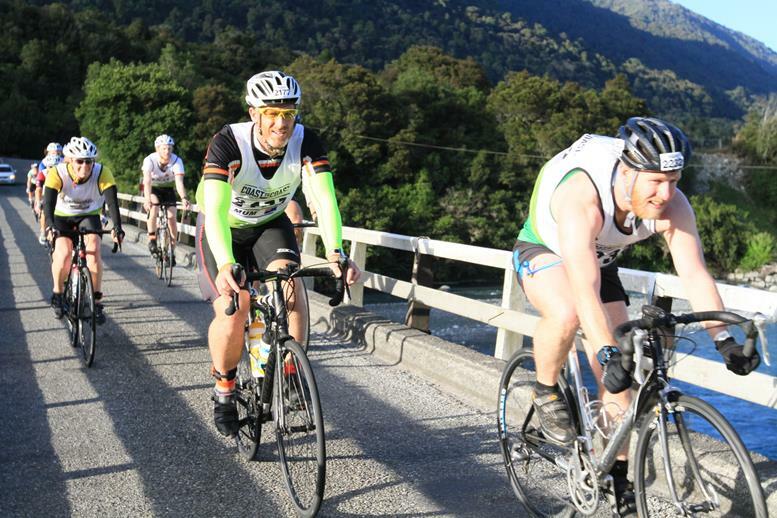 The 2018 New Zealand Kathmandu Coast to Coast is a multisport race that involves crossing 243Km on the South Island by Bike foot, and kayak. This took place on 9th and 10th February. I signed up to this originally with the intention of doing the Longest Day – the one-day full course event. By December with the race only in February I realised my preparation was less than adequate and I would struggle to meet the cut off times so opted to change to the 2 day event. Still a big task but I thought much more manageable and enjoyable……….. There are a lot of logistics involved before and during the event; this involved getting the equipment I would need for the race and transporting it around the course on the actual day. Every person or team taking part needs to provide their own support crew. Thankfully I had a great support team that involved my wife Trinity and her parents and an uncle who has taken part in the past so knows the workings of the event. 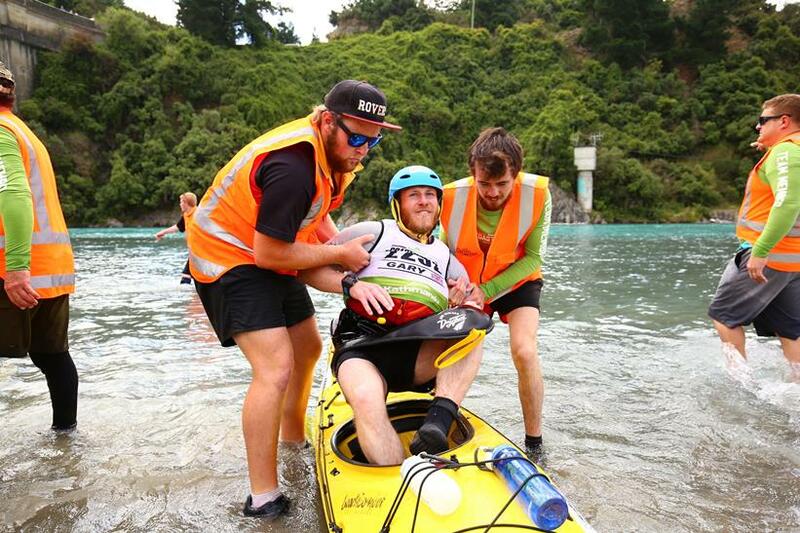 A friend of Trin’s dad offered his road bike for the event but the kayak proved to be a bit harder to get hold of. Turns out it is a very big event and all hire companies on the South Island were booked out months ago. In the end I managed to hire a sea kayak from a shop in Auckland who would be transporting a number of them down for the race. With all this sorted before I flew out to New Zealand it was a big relief. Friday was an early start, up at 4:45 to eat breakfast and take the bike to be racked at the 1st transition. Having never competed in any multisport race previously I thought I better figure out where I would run in and then how to find my bike amongst the hundreds of others! I then walked to the beach for the final race briefing at 6:45. The race started at 7am with the firing of a cannon by the original runner of the race, Robin Judkins, and then there is the 2.2km run to the bike transition. 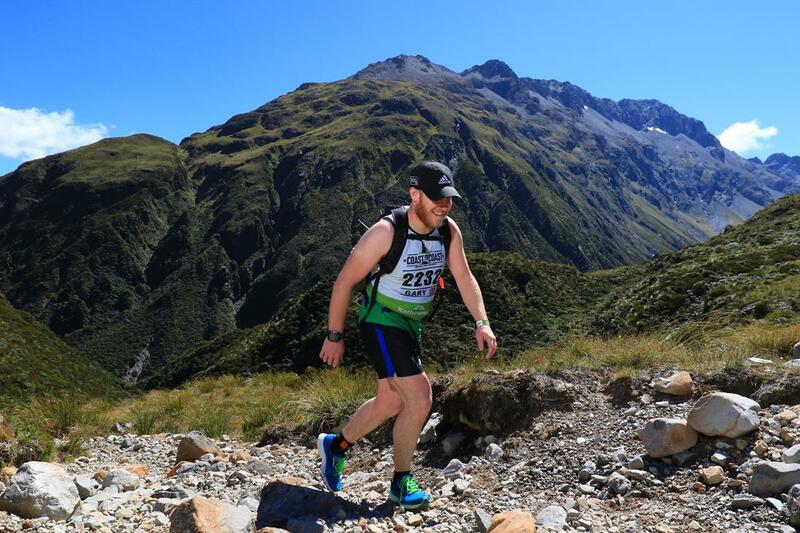 I had started at the back of the pack so I didn’t set out too quick especially as the days leading up to this I had been having some cramps in my quads and hamstrings. It was comfortable running and I was quickly passing people. On arrival at the bike transition I found my bike, shoes and rucksack with no dramas and set off on the initial 55km cycle. Having never cycled in a group before this was going to be interesting. I knew a small amount about group cycling and how they take it in turns to cycle at the front (not much knowledge obviously). The ride was generally flat with a few undulations and some fast downhills. Getting stuck in the middle of a pack was frustrating at times when on the downhills as I wanted to go faster than those around me but struggled to get out and around them. I upset a few people by trying to cycle down the middle at one point. I arrived at the 2nd transition racked my bike and ran round to find Trin with my mountain run gear. She spotted me 1st and shouted out and quickly started changing my shoes and bags. Trin and her mum were asking if I wanted food, drinks and sun-cream, with my usual thinking, this would cost me time and I had to quickly get back onto the course and start the 33km mountain run. The terrain got steeper as we neared ‘Goats Pass’ peak at 1085m where there was a mandatory kit check and you could refill drink bottles (although the river water is safe to drink in most places)……………………..
After getting a massage it was time to find my hire kayak to set it up and stick race numbers on it, then I was thankful for the cabin we had booked instead of having to camp! Before heading to bed I had to sort out my bags and equipment for the 2nd day. It was an early start again for day 2 where Trin and her dad had to get up at 4am to take my kayak and equipm ent for scrutineering. I had a bit longer in bed and didn’t need to wake until 5am, and once I had breakfast Trin’s uncle took me and my bike back to Klondyke Corner ready for the wave start. The waves were groups of 10 setting off at 1 minute intervals determined by yesterday’s finish times. I was in wave 16 and we set off on the initial 15km cycle. As this was a relatively short cycle, and I was going to be sat in a kayak for a while after, I decided that I would try and go flat out. A couple of other cyclists came with me and we made good progress with a lot less congestion compared to the day before, we quickly caught up and passed some cyclists from the other groups. At the end of the cycle I had to run 1.3km with my bike down a gravel road to the bike racking, and then made my way to the kayak. I had no idea how long it was going to take me to kayak 70km with the longest distance previously undertaken in a kayak was on the flat river Thames and covering 16km in 3hrs. Thankfully this was all downstream and the river was flowing at a decent rate. The first 25km is fairly flat without too many obstacles or features; it can get pretty braided so sometimes there is more than one route option. I tried to follow people who looked like they knew what they were doing and had paddled the course previously. At some of the known trouble spots there are rescue teams set up to deal with this. One guy on the bank threw me a throw line which I caught whilst another in a kayak got my boat and took it to shore, and another had rescued my paddle for me. Back on the bank I spent a few minutes emptying the kayak, getting my breath back and jumping back in before heading on my way again. I hoped that this wasn’t a sign of things to come as I had lost 10 minutes dealing with that which would add a lot of time to this section if I kept coming out. 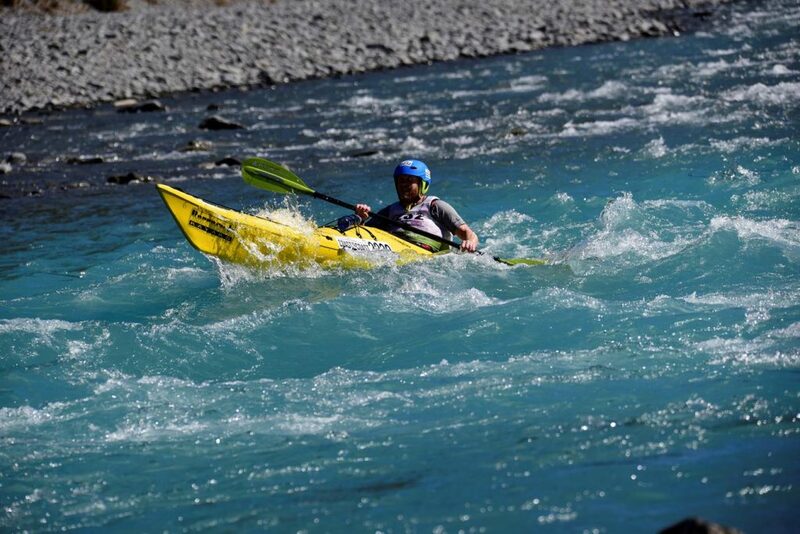 The hardest part of the course is the second 25km stretch which is through a gorge and contains a lot more rapids, this makes it a lot more fun but there is more chance of capsizing. Lots of rapids and wave trains, thankfully I never came unstuck and kept upright the whole time. All along the course everyone is really friendly and encouraging. You get chatting to people around you as people are from all over the world. Some are local and have paddled the river numerous times……………………. I knew I had almost completed it when I saw the Gorge Bridge ahead of me, a couple more bends and I could get out of the kayak. This was a relief as my back and leg were hurting from being sat for over 5 hours. As I came to the river bank there was an army of people to help the kayakers out. Two guys grabbed either arm and hoisted me out, my leg having seized up. From there, there was a cruel steep uphill run to the bike transition where I got changed slapped loads of sun-cream on and ran the short hill to the road with my bike. I knew this last 70km cycle was going to be hard not just with the distance but also the lack of other people around me to help draft. For the first 16km I was by myself but made good progress passing a few people, but sustaining 20mph on my own was tough. Thankfully a rider from a 3 person relay team caught up and for the next 8km we worked together picking up the pace slightly (although he ended up doing most of the work). Eventually it was too much for me to sustain and he started pulling away from me. Back cycling alone I slowed, It was tough going as the roads were so long and straight and the heat was again draining. 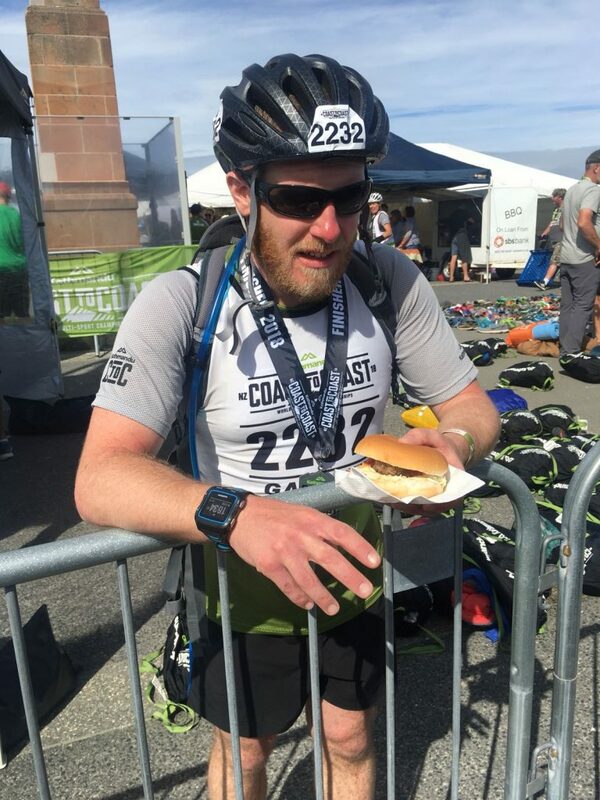 I kept getting water in me and then managed to take on some food. At one point I saw a sign that read ‘ The End of New Zealands longest straight road’, it was only a few minutes later I realised they must have meant the wrong end and this was only the start! 25km of dead straight road was mind numbing and tiring. My body was really aching, pains in my right quad and the bottom of my feet, I just wanted to get to the end. Eventually a larger group of cyclists caught up and asked if I wanted to join them. This was a welcome relief. I joined in and could relax slightly. They kept rotating at the front so everyone was getting a turn….. Soon we arrived in Christchurch and there was only about 16km left. We had to stop rotating as there was too much traffic so some of us started to speed up as the end was in sight. I finally saw the 1km sign and peddled as hard as I could. 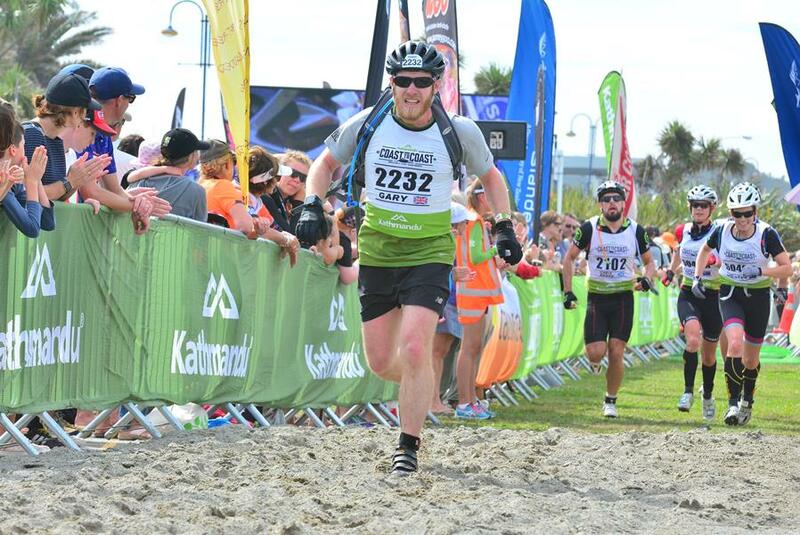 There was a line of marshalls waiting to catch me and hold the bike whilst I jumped off and ran to the finish line. There was a steep incline up a sand bank rising 3m and I pushed as hard as I could to get to the top where the finish was. The relief as I crossed the line and was again greeted with a handshake from Steve Gurney was immense. My total race time 15.56.15……………….. I enjoyed the cold drinks and free burgers provided and enjoyed the satisfaction of having completed the event. With my burger and support crew I hobbled to the beach to cool off in the sea. It was one of the most enjoyable events I have done, everyone was friendly and helpful. 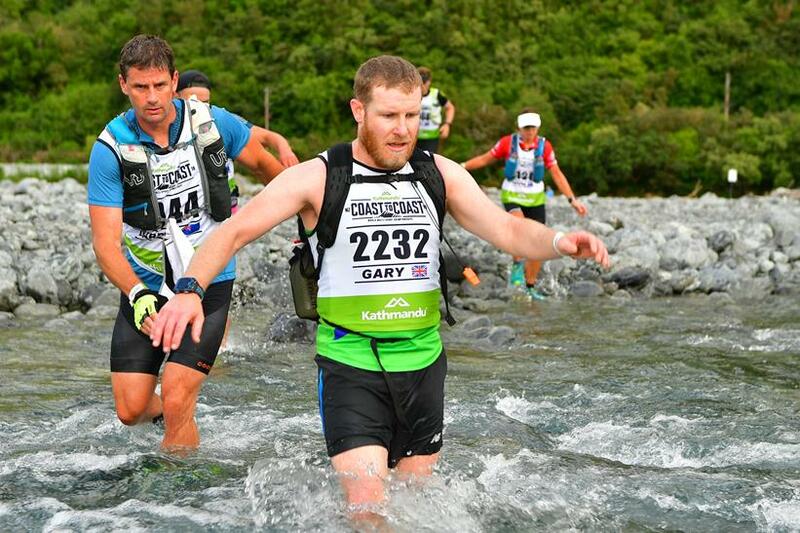 I can’t wait to head back and compete in ‘The Longest Day’…………..
Well done Gary and great write up. That rolling group on South Eyre Rd just kept on getting bigger till the turn into Christchurch. Made the last leg a lot easier . Thanks Rick. Yeah it made a big difference. I was definitely flagging by that point. Hello mate. Great write up. I am in a similar spot to you. Planning on doing next years race and trying to decide one day or two? I am organising a kayak now but not sure if the one recommended is long enough(fast enough). It is a barracuda sea kayak, 4.88m/16 feet. I can’t seem to find any recommendations on kayak length. Any tips would be greatly appreciated. I initially signed up for the one day event, but due to inadequate preparation made the decision to do the two day event especially with the tight cutoff times. Also for the support crew having not done it before the 1 day event could be a little hectic for them. I used Fergs kayaks who supplied and transported my kayak to the event (one less thing to worry about). The barracudas are the most popular for the event and is the one that I used. It will depend on your experience and ability if you want to go for something less stable and faster. What you gain in speed you may loose if you keep capsizing! Wanting to sign up for the 2020 race. A long way away but starting to look for a kayak to get and train in. Did you have any issue with a sea kayak? It seems like most of the ones used are more river racing ones? How early would you recommend booking stuff? Also, I want to do the 1 day “longest” event, what do you see as the hardest cutoff times? I’ve done an Ironman and feel more comfortable on the running and biking, but am completely new to kayaking. I live in Los Angeles, so my best training plan is the ocean.